PERCHED on its hind legs at the centre of the Lee Kong Chian Natural History Museum, Twinky the dinosaur has been immortalised with its front limbs in the air and its head lifted high, as though midway through a hearty meal of leaves and buds. At 12m in length, it is the smallest of the trio of diplodocid sauropod dinosaurs at the new museum in Kent Ridge, which the public can visit from tomorrow. Next to Twinky is graceful Apollonia, its 24m-long frame reaching up to overlook the museum’s mezzanine. Then there is Prince, all 27m of “alpha” male, stretched in a seemingly lazy manner across the centre of the 2,000 sq m exhibition space. Their easy poses belie the efforts of a team of almost 30 museum staff, professional art movers and dinosaur experts to set up the exhibit – the star attraction of Singapore’s first and only natural history museum. 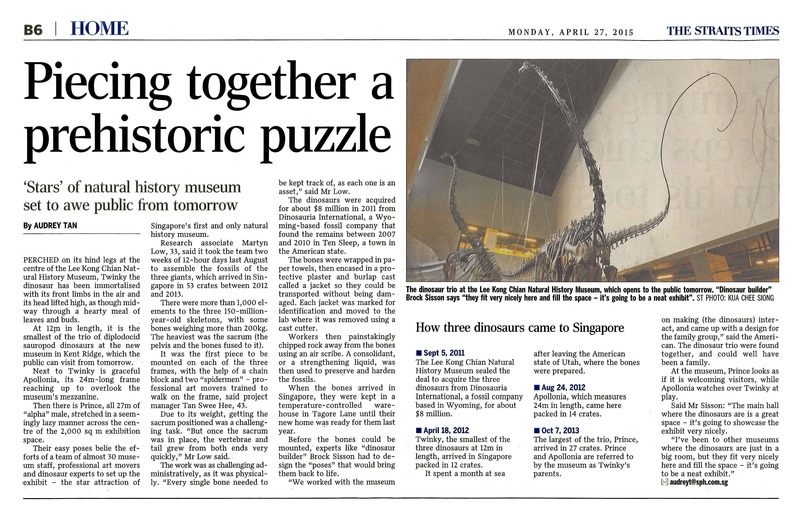 Research associate Martyn Low, 33, said it took the team two weeks of 12-hour days last August to assemble the fossils of the three giants, which arrived in Singapore in 53 crates between 2012 and 2013. There were more than 1,000 elements to the three 150-million- year-old skeletons, with some bones weighing more than 200kg. The heaviest was the sacrum (the pelvis and the bones fused to it). It was the first piece to be mounted on each of the three frames, with the help of a chain block and two “spidermen” – professional art movers trained to walk on the frame, said project manager Tan Swee Hee, 43. Due to its weight, getting the sacrum positioned was a challenging task. “But once the sacrum was in place, the vertebrae and tail grew from both ends very quickly,” Mr Low said. The work was as challenging administratively, as it was physically. “Every single bone needed to be kept track of, as each one is an asset,” said Mr Low. The dinosaurs were acquired for about $8 million in 2011 from Dinosauria International, a Wyoming-based fossil company that found the remains between 2007 and 2010 in Ten Sleep, a town in the American state. The bones were wrapped in paper towels, then encased in a protective plaster and burlap cast called a jacket so they could be transported without being damaged. Each jacket was marked for identification and moved to the lab where it was removed using a cast cutter. Workers then painstakingly chipped rock away from the bones using an air scribe. A consolidant, or a strengthening liquid, was then used to preserve and harden the fossils. When the bones arrived in Singapore, they were kept in a temperature-controlled warehouse in Tagore Lane until their new home was ready for them last year. Before the bones could be mounted, experts like “dinosaur builder” Brock Sisson had to design the “poses” that would bring them back to life. “We worked with the museum on making (the dinosaurs) interact, and came up with a design for the family group,” said the American. The dinosaur trio were found together, and could well have been a family. At the museum, Prince looks as if it is welcoming visitors, while Apollonia watches over Twinky at play. Said Mr Sisson: “The main hall where the dinosaurs are is a great space – it’s going to showcase the exhibit very nicely.